Even the distance of one block has major implications on Mobile Search app results. 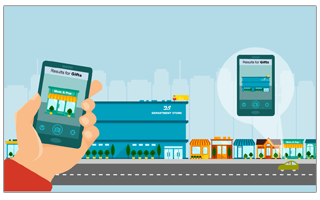 MobileHorizons tracks multiple precise locations to mimic a Mobile user on the move. located at the time of the query. You can be a block away and get a completely different result. Crossing an intersection can make the difference in whether or not your business shows up in Mobile Search App results. MobileHorizons allows you to compare and triangulate results for several precise locations within the same neighborhood; accurate to the building. Our rankings allow you to compare your client’s business against the competition in multiple locations and our screenshots of the Apps Results Pages show the implication of location on your client’s performance.